STOP. THINK. Before you do something in violence, you might regret later. 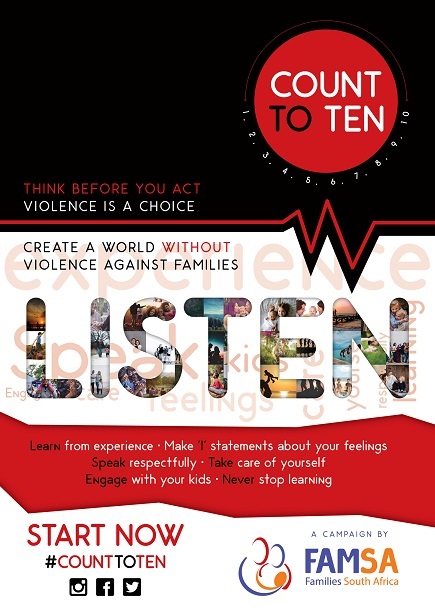 FAMSA’s CountToTen campaign focuses on preventing violence against Women, Children, Families, Men. FAMSA will conduct various community talks in Bloemfontein and Petrusburg from 26th November to the 7th of December 2018, and distribute information and shopping bags: 26th Nov – Motheo FM, 29th Nov – ATANG school, 29th Petrusburg Clinic, 30th Rocklands Clinic, 7th Men and Boys event Kagisanong. CountToTen is a “time out” method and promotes emotional assertive communication – express your needs without abusing another.